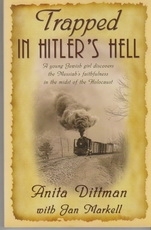 "Anita Dittman was just a little girl when the winds of Hitler and Nazism began to blow through Germany. By the time she was twelve the war had begun. Abandoned by her father when he realized the price of being associated with a Jewish wife and family, Anita and her mother were ultimately left to fend for themselves. Anita's teenage years are spent desperately fighting for survival yet learning to trust in the One she discovered would not leave her..."